“There is geometry in the humming of the strings. There is music in the spacing of the spheres.” Following Pythagoras’ revelations on the interconnection between science and music, as quoted by Aristotle in his Metaphysics, music will feature prominently in the conference programme. Thanks to the Swiss Academies of Arts and Sciences participants will be able to discover and enjoy musical experimentations and performances by some of the most talented musicians in Switzerland. 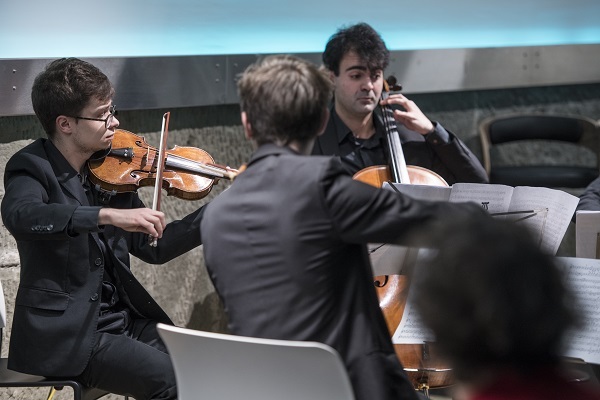 Jakub Przybycień, Jacek Świca, Dominik Klauser and Alessandro Sica, who attended Bern University of Applied Sciences, are the four talented musicians that form Gardan Quartet. In 2017, the string quartet won Orpheus – Swiss Chamber Music Competition. This success paved the way for them to perform at the Swiss Chamber Music Festival and also at the Festival Musikdorf Ernen. Their music will accompany the Madame de Staël Prize award ceremony on 8 May. Experience a musical intervention with a modern twist. Matthias Müller is a musician, a Professor for Clarinet at the Zurich University of the Arts and the founder of SABRe. In his performance, he innovatively combines the classical tone of acoustic music with the digital world, which allows the audience to experience a musical performance from a new perspective. He will be performing on 9 May as an interlude of the scientific symposium ‘Science and Society in Present-day Europe’.